History is mostly just the story of stuff men did. But these female adventurers deserve to be celebrated! This Dutch explorer came from a wealthy family. 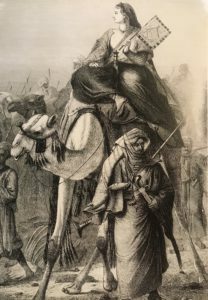 After traveling across Europe and the Middle East, she settled in Cairo and devoted herself to exploring Africa and fighting against the slave trade. Her first major expedition was a trip to Sudan, where she reached Khartoum and paid for the release of 100 slaves. She later explored the White Nile and its tributaries. After studying the Koran and Arabic history in Cairo, she adopted Muslim customs. During her final journey to Lake Chad, she was murdered by a Tureg tribesman. She is remembered mostly for her courageous fight against the slave trade in Eastern Africa. Sarah Winnemucca was born in 1844 to the Northern Paiutes, a nomadic tribe that occupied parts of Oregon, California, Nevada, and Idaho. Her parents named her Thocmetony after the flower that makes the desert bloom. An activist, author, and educator, Winnemucca dedicated her life to fighting for her people. During the Paiute War of 1860, in which the Northern Paiutes allied with the Bannock and Shoshone against the U.S., and subsequent clashes, Winnemucca lost her mother, sister, and younger brother. She later served as an interpreter and negotiator between her people and the U.S. Army. During the Bannock War of 1878, she rescued her father and 75 men, women, and children from the Bannock, leading them 230 miles through rugged terrain to U.S. Army protection. As an activist, Winnemucca gave hundreds of speeches about the plight of her people, and in 1880 pleaded their case before President Rutherford B. Hayes, who made promises the U.S. government broke. 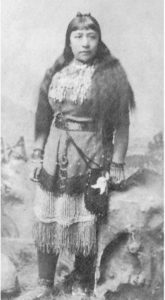 Winnemucca published her autobiography in 1883, the first book written by a Native American woman, and at the end of her life opened a school for Paiute children. French explorer, author, and Buddhist scholar Alexandra David-Neèl was plagued by wanderlust from a very young age. At the age of 18, she tied her possessions to the handlebars of her bike and headed to Spain. 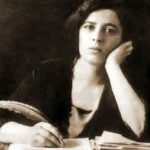 On that trip she also became involved with a London study group associated with Russian occultist, philosopher, and author Madame Blavatsky. In 1889, 21-year-0ld David-Neèl was considered legally an adult. Finally able to do as she pleased, she audited courses in Eastern Religion at Sorbonne University then lived in India until her money ran out. After spending several years singing with a traveling opera company, she married railroad engineer David Neèl, but hyphenated her name, which was not a common practice at the time. 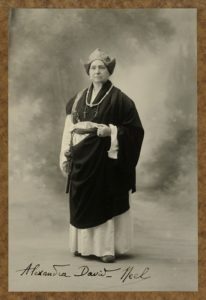 David-Neèl returned to India in 1911, where she met the thirteenth Dalai Lama. She is believed to be the first white women to discuss spiritual enlightenment with the leader of Tibetan Buddhism. Seeking to further her quest for enlightenment, she spend more than a year in a cave in Sikkim, a state northeastern India, where she subsisted on one meal a day. At the age of 45, David-Neèl disguised herself as a beggar woman and traveled to the Forbidden City of Lhasa with her adopted son, a Sikkimese monk. During their 8-month journey, she lived on barley flour, a little tea and butter and entered the city unrecognized. The city, which was populated mostly by monks, had barely changed in 100 years. Born in Atlanta in 1892, Bessie Coleman soon joined her family in the cotton fields, and earned her education in a one-room shack that lacked even the most basic supplies. Her interest in aviation was inspired by soldiers returning from the battlefields of WW1, who told wild tales of their in-flight exploits. At the time, very few pilots in the U.S. were women, and they were mostly white and wealthy. Coleman was turned down by every flight school she approached. In 1920, backed by two wealthy African American entrepreneurs, she left for France. 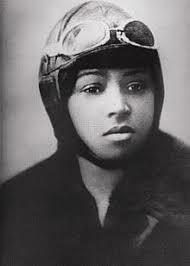 On June 15, 1921, Coleman received the first pilot’s license issued to an African American—of any gender—from Federation Aeronautique Internationale. During her brief 5-year career, she refused to perform air shows before segregated crowds and nearly raised enough money for the first African American flight school. On April 30, 1926, Coleman took her last flight in Jacksonville, Florida, where she died in a tragic accident. Held on Chicago’s South Side, her funeral was attended by 10,000 mourners. Explorer and travel writer Freya Stark traveled to remote areas of the Middle East and Turkey, where few Europeans had ventured, and wrote dozens of books about the local history and culture. On a trip to Luristan, a region in south Kurdistan occupied only by Lurde nomads, she made important archaeological findings about the ancient sites of Hindimini and Larti, according to the Encyclopedia of World Explorers. She also visited the Valley of the Assassins, a religious and political community founded in 1090 by the Persian Hasan ibn al-Sabbah, known for getting high on hashish and killing their enemies. She later studied the Arabic peninsula, where she explored southern Hadramaut. Married at 21, English explorer, adventurer, and travel writer Joan Rosita Forbes provoked her first public scandal when, six years later, she divorced her husband and attempted to ride across South Africa on horseback. After authorities intervened, she spend two years driving an ambulance at the French Front during WWI. From 1917-18, she traveled to 30 countries and developed an interest in Arab culture. In 1920, accompanies by Egyptian explorer and diplomat Hassanein Bey, she became the first woman to reach Kufrah, a strategically significant oasis group in the Libyan desert. Two years later, she traveled through Asia, then made topographical studies in Abyssinia, a nation that made up the northern half of present day Ethiopia. In 1934, she traveled to Central and South America, where she flew over vast stretches of the Amazon. 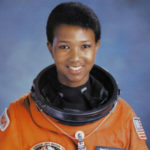 No list of female adventurers would be complete without Dr. Mae C. Jemison, the first African American woman in space. The youngest child of Dorothy Jemison, an elementary school teacher, and Charlie Jemison, a carpenter and roofer, in 1973 Jemison attended Stanford University with a National Achievement Scholarship. After earning her M.D. in 1981, Dr. Jemison practiced, taught, and performed medical research in Sierra Leone and Liberia. On June 4, 1987, she became the first African American woman admitted into NASA’s astronaut training program. On Sept. 12, 1992, Dr. Jemison flew aboard with Endeavor on mission STS47, becoming the first first African American woman in space. She is also the founder of The Jemison Group, a technology consulting firm, BioSentient Corporation, which provides real-time monitoring of the autonomic nervous system, and The Dorothy Jemison Foundation for Excellence, a nonprofit that promotes science literacy, critical thinking, and other skills in education. Tired of Street Harassment? Take the Power Back.